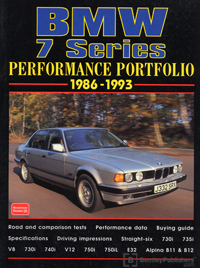 This BMW 7 Series Performance Portfolio: 1986-1993 is a collection of 35 original articles compiled from the pages of Autocar, Fast Lane, Motor, Motor Trend, and Road & Track. The information collected in these reprinted articles includes 11 road tests, plus specifications, touring and long-term reports. The first of the 7-series cars appeared in 1977 quickly developing into a big six-cylinder engine and then becoming turbocharged in the early 1980s. This is a book of contemporary road and comparison tests, specification and technical data, new model introductions, driver's reports, long term reports, special models.